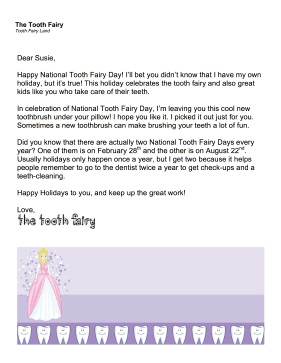 Great as correspondence on February 28th or August 22nd, this printable letter addresses National Tooth Fairy Day. Happy National Tooth Fairy Day! I'll bet you didn't know that I have my own holiday, but it's true! This holiday celebrates the tooth fairy and also great kids like you who take care of their teeth. In celebration of National Tooth Fairy Day, I'm leaving you this cool new toothbrush under your pillow! I hope you like it. I picked it out just for you. Sometimes a new toothbrush can make brushing your teeth a lot of fun. Did you know that there are actually two National Tooth Fairy Days every year? One of them is on February 28th and the other is on August 22nd. Usually holidays only happen once a year, but I get two because it helps people remember to go to the dentist twice a year to get check-ups and a teeth-cleaning. Happy Holidays to you, and keep up the great work!